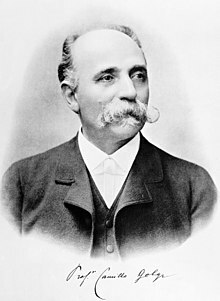 Camillo Golgi (Italian: [kaˈmillo ˈɡɔldʒi]; 7 Julie 1843 – 21 Januar 1926) wis an Italian pheesician, biologist, pathologist, scientist, an Nobel laureate. Several structurs an phenomena in anatomy an pheesiology are named for him, includin the Golgi apparatus, the Golgi tendon organ an the Golgi tendon reflex. He is recognised as the greatest neuroscientist an biologist o his time. ↑ Gerd Kempermann MD (2001). Adult Neurogenesis (2nd ed.). Oxford University Press. p. 616. ISBN 978-0199729692. This page wis last eeditit on 20 August 2016, at 02:20.